We must be thinking along the same lines. I just sat down to write my blog for this week and read Ron’s blog, The Lonely Spirit, over on spreadinggoodness.org – obviously we are thinking similar thoughts! What role does the Bible play in the ministry of the church? Typically I suspect we contrast two kinds of churches. In one, the Bible is dismissed or disbelieved. Its role is token and the sermons reflect some kind of contemporary political or cultural bias determined by the minister. If the focus shifts to the Bible, then it may be to deny some truth or remove some “mythology” from the text. And in the non-liberal churches the Bible is preached, explained, applied and honoured. After all, is the use of the Bible not the measure for distinguishing the liberals from the non-liberals? I’d like to put the liberal discussion to one side for now, important as it is. What if there are three types of Bible use? Maybe there are three types of churches? 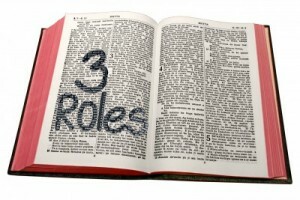 Perhaps in some churches there are all three uses to be found in different ministries. Bible Role 1: Instruction Manual. This role can be dressed in different clothing, but it is basically the same. The Bible is held aloft and honoured like a mechanical guide for fixing the car of your life. This can look like heavy law-based religious teaching in a dark suit, or highly practical applied teaching in casual attire. The logic is simple: the Bible contains instructions that are to be obeyed in order to achieve successful independent living. The instructions may be moral code or life principles. The leverage will tend to be greater pressure and some form of guilt. The response to this approach will be positive, but limited. Either people will praise the practical and applied teaching (but then struggle to implement all the how-to steps they’ve listed in yet another bulletin stuffed into their Bible). Or people will celebrate the feeling of being whipped, since our flesh does like a good dose of religion (but then struggle to live up to the commitments made under the pressure of the Sunday whipping). Bible Role 2: Experience Gateway. This role can also be dressed differently, but essentially the role is consistent. The Bible is engaged briefly, typically in one of the more obscure corners of the canon, and the wording is then used as an endorsement of something about to be experienced by the more spiritual. This can look like a hyped-up moment of experiencing supernatural power, or a quiet super-spirituality from a more contemplative and mystical guru. The logic is simple: the Bible contains precedent that should be briefly and superficially engaged in order to introduce a personal pursuit of a profound experience. The text may be historical narrative treated as normative, or a principle plucked from its printed context. The leverage will tend to be the greater anointing of the presenter and some sense of mystery. The response to this approach will be positive, but limited. People will praise the spirituality of the presenter. They will typically desire the same experience that they are convinced the presenter has had, but will probably leave either unconvinced that they could ever achieve the same experience, or thoroughly convinced that whether they get there or not, what they have heard trumps all alternatives, no matter what the Bible may say. In many cases the convictions regarding the experience will tend to be vicarious since the listeners may strive, but will struggle to reach the same lofty goals. Bible Role 3: Personal Introduction. This role can also be dressed up in different denominational garb, but there is one consistent conviction. The Bible is not honoured as an end in itself, but as a gift from a loving Father. This can be dressed in traditional religious forms and liturgy, or in a highly contemporary feel. The logic is simple: the Bible is a personal revelation of God the Father in the person of His Son by the work of the Spirit, that calls for response for the sake of relationship. The revelation will tend to emphasize both the promise and the promiser. The leverage (although that seems like the wrong word), will tend to be the presenter’s delight in fellowship with God, combined with some sort of invitation. The response to this approach will be mixed. Some will delight in what they see and hear in the Bible; leaning in and discovering a God that is a delight to know. They will be amazed that a God so wonderful would love them so profoundly, and their response will typically be gradual but profoundly transformational. Over the course of time, these people will seem warmed from the inside-out as the work of God in their hearts spills into their attitudes and actions. But others will resist what is being presented. They will complain because their deepest desire is essentially something other than genuine fellowship with this God. They might prefer to be guilted with pressure to perform, instructed so they can tick the boxes and press ahead, or they might prefer a super-spirituality that is shaped by something other than the biblical marital motif. The bottom line is relatively simple. My flesh is attracted to roles 1 and 2. My heart is stirred by role 3. If you preach to me, please introduce me to the God who to know is life itself. When I preach to you, pray that I’ll do the same.